Many companies design their software to run on a specific version of Windows. When a new Windows version, like Windows 8, appears a few years later, some older programs feel threatened by their new environment and refuse to work. If an older program refuses to run under Windows 8, you still have hope because of Windows’ secret Compatibility mode. This mode tricks programs into thinking that they’re running under their favorite older version of Windows, letting them run in comfort. When the Properties dialog box appears, click the Compatibility tab and then click the Run Compatibility Troubleshooter button. In its robotic way, Windows 8 tries to guess what version of Windows your program needs, and then it applies the changes. If the program begins working, you’re through. If the program still has trouble, though, move to Step 3. 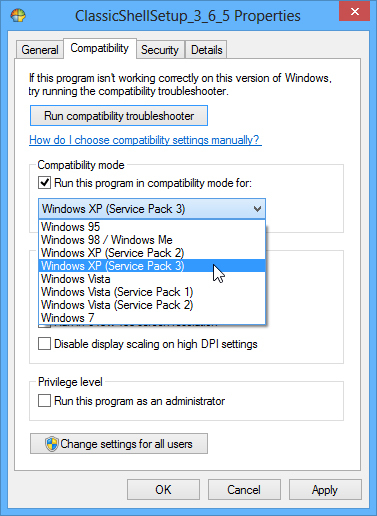 In the Compatibility Mode section, select the Run This Program in Compatibility Mode For check box and select the program’s desired Windows version from the drop-down list. Click OK and then try running your program again to see whether it works better. If your older program doesn’t run, it’s time to upgrade to a newer version. Did this glimpse into how to use Windows 8 Compatibility Mode to run old programs leave you longing for more information and insight about Microsoft’s personal computing operating system? You’re free to test drive any of the For Dummies eLearning courses. Pick your course (you may be interested in more from Windows 8), fill out a quick registration, and then give eLearning a spin with the Try It! button. You’ll be right on course for more trusted know how: The full version’s also available at Windows 8.